From left to right: Plaza El Segundo Pre-Valentine’s Day invitation, SweetXO cake balls and candy, me in front of a colorful candy selection, the goodie bag with filled with gifts from plaza retailers. I always enjoying discovering new places to shop that are nearby and totally unexpected. I was recently invited to a Pre-Valentine’s event at Plaza El Segundo, and I was excited to see what I could find there! First, I didn’t realize that Plaza El Segundo was in my back yard. Roughly 20 minutes away with no traffic, there is a beautiful plaza just South of LAX with a nice mix of stores, such as Whole Foods, Container Store, and Anthropologie. I arrived at the tail end of the event, but I was so glad I made it in time to mosey around SweetXO! 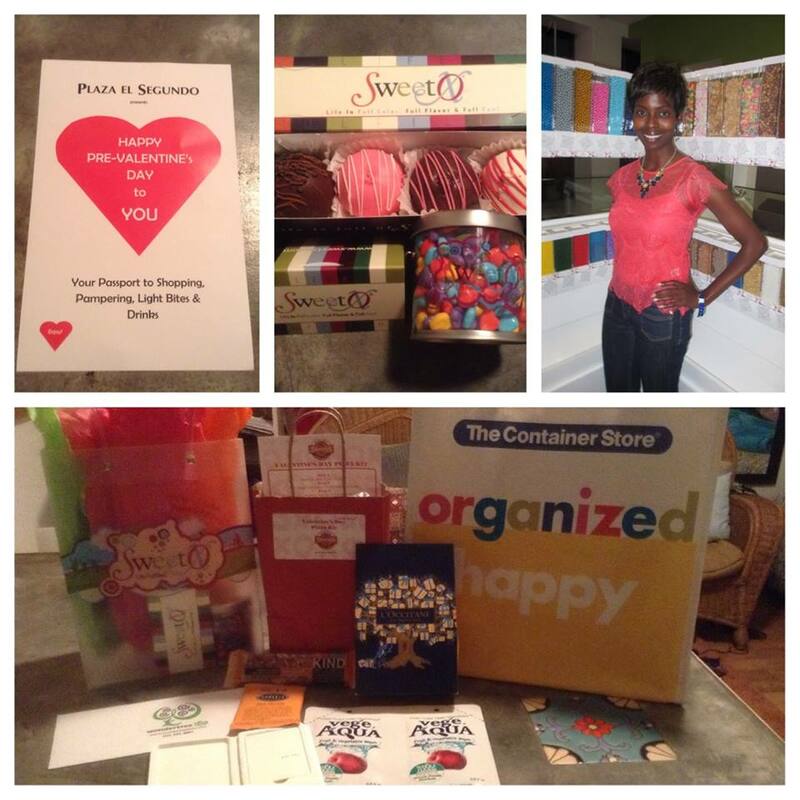 SweetXO is a sweet tooth’s dream – it’s a candy store, bake shop, ice cream and yogurt haven with a gift shop mixed in. The fun colors all throughout the store made this a definite keeper for me since bright hues always make my day. There was a pop of every color of the rainbow in the store and I commend SweetXO for taking it to the next level by keeping things fun and playful in this unique retail destination. And what a smart idea to have a lounge with white leather seating where you can get social and enjoy your goodies! I tried a few flavors of ice cream and took home a special treat, SweetXO cake balls – I must say these are the BEST cake balls I have ever eaten! They were so decadent and moist that even though I wanted to eat 2 in one sitting I settled for 1 a night until they were gone (Had a pack of 4). There was so much to take in that I definitely have to make a trip back to really enjoy it all, but the goodie bag I received helped give me an intro to what’s in store. For all your sweet tooth needs, look no further than SweetXO – you will not regret it! It was fun meeting you there. We’d love to have you back at any of our locations. Did you try our Frosted Flake Ice Cream? That was everyone’s favorite. See you soon!